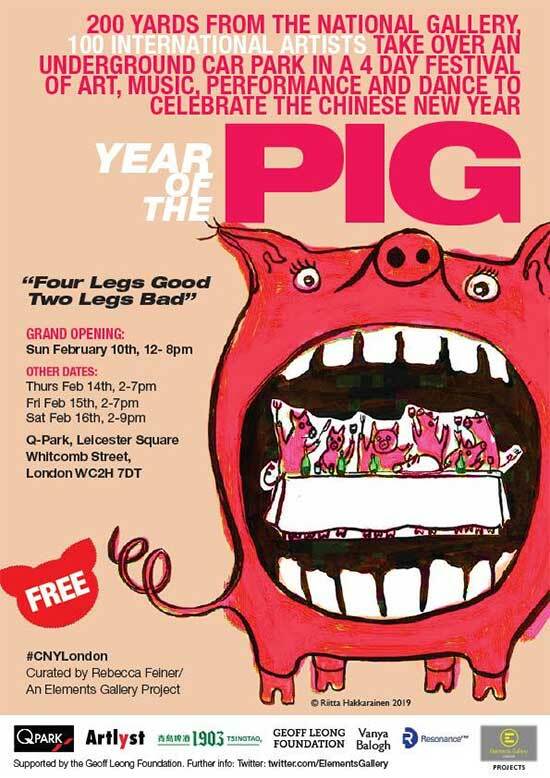 Two hundred yards from the National Gallery London, over 100 international artists stage a TAKE OVER of an underground car park for fours days of FREE art, music, performance and dance to celebrate Chinese New Year 2019 #CNYLondon Year of the Pig. This subterranean expo is a unique opportunity to explore a slice of the capitals DIY contemporary art scene in the heart of the west end. Experience the myriad artist responses to the theme of Year of the Pig, ‘Four legs good, two legs bad’, a quote from George Orwell’s prescient 1945 book Animal Farm. Urban, underground, it is the contemporary art antidote to the flock wall paper & institutionalized art of the national Gallery just 200 yards away. Here, below street level you can encounter anything and probably will. race, gender and migration. Hear Euro Asian electronic music, watch an adult interpretation of fairytale, the Three Little Pigs via Butoh Dance. Witness an invitation to dinner with a twist, visually consider capitalism and ecology, visit a paper theatre, and think about pigs in ancient literature. Walk on Brex-it poetry, question the meaning of wealth and happiness and much more. Energetic, irreverent, thought provoking and fun. We look forward to you joining us underground!. #CNYLondon is the largest celebration in the world (outside Asia) with Trafalgar Square, Leicester square and China Town hosting over 300, 000 visitors enjoying everything from dragon dances, martial arts, parades to pyrotechnics and Chinese cuisine. This entry was posted on 2 February, 2019 in homepage and tagged Julie Goldsmith. Bookmark the permalink.